***Translations and interview at Tupelo Quarterly. ***Read "About Forgetting: The Tale of the Zombie Poem"
from the Spanish of Uruguayan Karen Wild Díaz. bilingual Spanish/English layout in WAXWING! América invertida at Moe's Books in Berkeley, California. bone up on Uruguayan poetry at DRUNKEN BOAT. Fernández de Palleja at WORLD LITERATURE TODAY. and English translations, is out! ***ANTI-FERULE now available at Toad Press website! ***Brief fiction up at JUKED: read "Albuquerque" here. 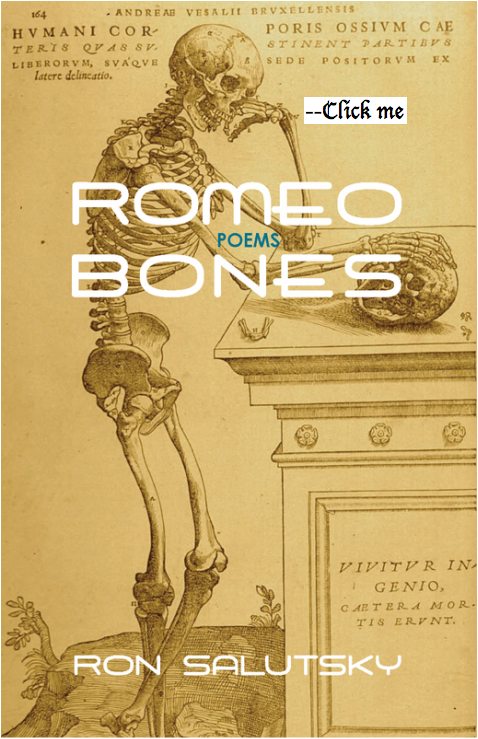 Romeo Bones here at the Southeast Review. ***Listen! to "Hiking at Bee Rock" here on NPR. ***Read "Hiking at Bee Rock" now at Narrative Magazine. neuroscience in the John Clare Society Journal. ***Be sure to LIKE the Ron Paul Salutsky Facebook page! ***"Translation and its Legacy in Poetry In English"
Barnstone, Aliki Barnstone, and Monica Hand. at The Warehouse, 8 pm. ***"Romeo Bones" on Verse Daily!